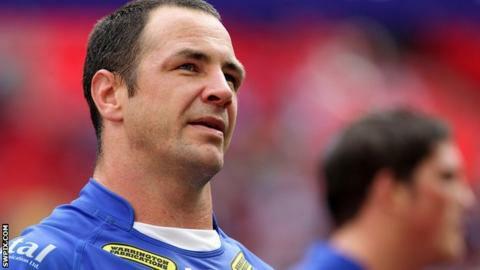 Warrington captain Adrian Morley will wait before deciding if the 2013 season is to be his last in Super League. Forward Morley, who will turn 36 in May, plans to assess his own form and will consult Wire coach Tony Smith before making a call on his future. He told BBC North West Sport: "I'll have a chat with Tony midway through the season to see where we are. "I trust Tony's judgement. He'll tell me if the club want me and whether I'm up for the rigours of another year." But speaking ahead of Warrington's first competitive game of the domestic campaign at home to Castleford on Sunday, Morley continued: "That's a long way down the line yet. "I'm not desperate to get out there and prove I'm worthy of a contract for next year. I'm just worrying about playing well." But Morley, who played a part in all three matches of England's Autumn International Series win, said at the time that he before agreeing to prolong his career for an extra year. Much of Warrington's success last season was based on Smith's rotation policy, which meant he was able to give valuable rest to experienced players such as Morley, half-back Lee Briers and full-back Brett Hodgson, and keep them fresh for the big occasion. When asked if he would be doing the same in 2013, the Australian replied: "Most definitely. "It was part of our strength last year and why we were competitive throughout the whole season. "We could have easily milked them dry of their energies and talents and broken them. "All the boys were jumping out of their skins still by the end of the year so we'll take care of them and make sure they're hopefully fit and healthy again this year. "I don't think anybody will be surprised that Briers, Hodgson and Morley won't play 27 consecutive rounds of the Super League, then hopefully every round of the Challenge Cup and hopefully right through the Grand Final. There will be weekends of rest, no doubt."